A/V integration 4K HDBaseT 4x4 Matrix is a a BRAND NEW 4K 4x4 HDbaseT/Hdmi Matrix Switcher with simultaneous audio outputs and HDCP2.2 support! 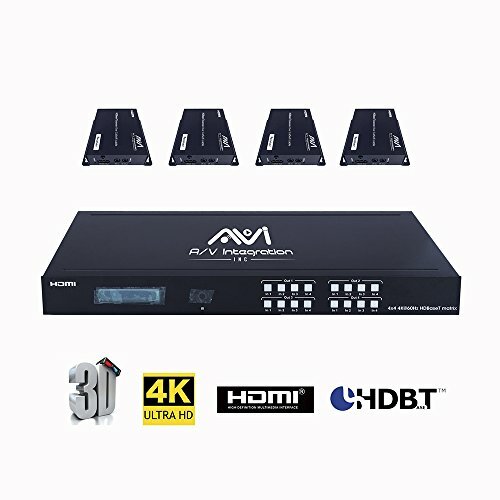 This switcher allows you to route 4 input sources (Bluray, Cable Boxes, Directv, etc) to 4 output sources (Televisions, Projectors, etc). It supports full 4K/3D resolution! With this switcher, you can choose ANY of your 4 sources to display on ANY of your 4 televisions. This type of switch is also perfect for media in sports bars, casinos, hotels, custom homes, apartments and night clubs. We also offer installation and programming services for your needs! THE 4 HDBASET RECEIVERS ARE INCLUDED. YOU DON'T HAVE TO PROVIDE YOUR OWN HDBASET RECEIVERS TO GET VIDEO TO YOUR OWN TVS. The simultaneous audio outputs are incredibly important and necessary! -HDMI 2.0 version (Support HDMI2.0 4K50/60Hz YUV420). -Support high definition resolutions 4K@60, 4K@30, 1080P, 1080i, 720P and standard video format. -Transmit up to 70m under 1080p, 35m under 4K@30Hz. -4 HDMI input ports, 4 HDBaseT output ports. -Any one of the 4 sources to any one of the 4 Displays. -With wide-band Bi-Direction IR routed control(38~56KHz) IR extension from Sender to Receiver or from Receiver to Sender. -Support Panel Button, IR Routing, RS232 Control, IP Control Via Telnet. -POC (Receiver powered by HDBaseT Matrix). -1U rack design, easy installment. -1x IR Extension cable; 4x Wide-Band "IR In" cables; 4x "IR Out" cables. 4 INPUTS AND 4 OUTPUTS: Distribute any source to any display via Cat5e/Cat6, the four output signals can be different or the same.EXTEND SIGNAL UP TO 230 FT:Transmit up to 230 ft @ 1080P, 115 ft at 4K@60Hz. 4 Different control methods. IR remote control, RS232 CONTROL VIA INCLUDED PC SOFTWARE, IP CONTROL VIA WEB BROWERS, and HARD BUTTON CONTROL VIA FRONT PANEL. It supports full 4K resolution! We have many units for sale...and it comes BRAND NEW with remote control, power cable, rack ears, RS232 serial cable, and IR extender. With this switcher, you can choose ANY of your 4 sources to display on ANY of your 4 televisions. This type of switch is also perfect for media in sports bars, casinos, hotels, custom homes, apartments and night clubs. We also offer installation and programming services for your needs! HDCP 2.2 / 1.4 COMPLIANT. If you have any questions about this product by AVI, contact us by completing and submitting the form below. If you are looking for a specif part number, please include it with your message. Black Box CAT6 550-MHz Solid Bulk Cable UTP CMR PVC Pull Box Blue 1000-ft.